Posted on October 14, 2015 at 2:12 pm. Stewart Donald Adam was born in 1893 to parents Andrew and Martha. He was their 4th son, born and raised in Hyde Park where he went to school. Stewart found work in Crimpsall Erecting Shop at the Great Northern Railway Works (The Plant) as an apprentice. He joined the 6th Battalion of the King’s Own Light Infantry when war broke out in 1914 as one of the early volunteers. Three of his workmates from the Plant also joined up with him. Sadly they were all killed when a shell hit their trench when the battalion was on active service in France in June 1915. A newspaper article from the 9 July that year carried the story of the fallen “Comrades in Arms”, giving the date of death as 28 June, though official Army records show it as happening on the 29th. His brother Alec was also serving, in the 24th Cameron Highlanders. Stewart was buried next to one of friends he died alongside, Charles Torr. As a member of Friends of Hyde Park Cemetery, I have very recently answered a Grave Finder Enquiry from a Mr George Napier, concerning his grandparents, who are buried in Hyde Park Cemetery. Their names are Andrew and Martha Adam (i.e. parents of Private Stewart Donald Adam). Mr Napier is, therefore, the nephew of Private Adam. I have told Mr Napier (who is aged 90+) about this website entry and he was most interested. 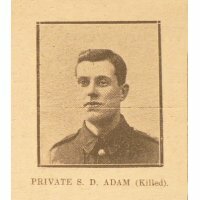 He tells me that the only known memento of Private Adam is a postcard that he’d sent to his mother shortly before he was killed. It was brief and along the lines of “See, we do get some time off after all”! Stewart Adam is my great uncle. Some years ago I was able to visit his war grave in the Bedford House Cemetery near Ypres. Andrew and Martha are my great grandparents so George must be a cousin. Would love to meet him! George Napier is my father and lives in Sprotbrough near Doncaster. He would welcome conversation with you about the family. Many thanks. Please give your father my best wishes. Charles was my father if you knew him? Likewise, would welcome a conversation if that could be arranged.